Part Used & Method for Pharmaceutical Preparations: The inside membrane of the gizzard is peeled off, cleaned and dried in the sun. Then it is ground into powder. Meridians: Spleen, stomach, small intestine and urinary bladder. Functions: 1. To eliminate food retention; 2. To transform stones. 1. Indigestion, retention of food and epigastric and abdominal distension and fullness. Chicken's gizzard skin (Jineijin) is used with Hawthorn fruit (Shanzha) and Germinated barley (Maiya). 2. Infantile weakness of the spleen, including infantile malnutrition. 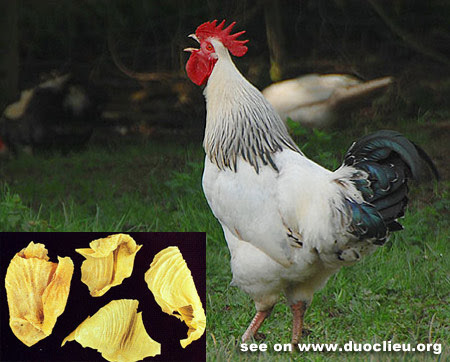 Chicken's gizzard skin (Jineijin) is used with White atractylodes (Baizhu), Dioscorea (Shanyao) and Poria (Fuling). 3. Gallstones and urinary tract stones. Chicken's gizzard skin (Jineijin) is used with Lysimachia (Jinqiancao) and Lygodium spores (Haijinsha) in the formula Sanjin Tang. Cautions & Contraindications: If the herb is prepared as a powder, the dosage each time is 1.5-3 g.